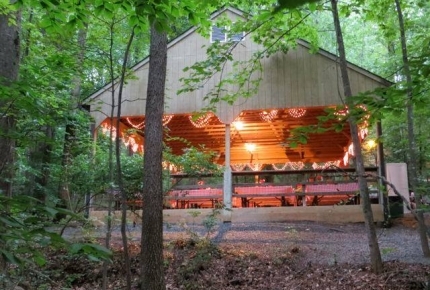 This venue is located in the heart of Reston, Virginia, conveniently located on eight wooded acres adjacent to Lake Fairfax. This unique location boasts a floor plan perfectly suited for indoor and outdoor entertaining. When you choose the Fairfax Hunt Club, you’ll get more than just a charming façade rooted deep in Virginia history. J.R.’s Custom Catering provides award-winning food and highly trained staff has been satisfying people from Northern Virginia and the Washington Metro area for more than 42 years. The Fairfax Hunt Club was created in 1928, on the very same land that George Washington rode to hounds. The club’s fascinating history plays into the allure and charm of the venue, with original logs dating back from over 200 years that can still be found in the reception room. Traditions of hosting hunt events in the main dining hall have been passed down to current members, who still gather there for their post-hunt breakfasts and other social activities. Have J.R.’s Cater Your Event!